For the past thirteen years, our small charitable public space group, the Centre for Local Research into Public Space (CELOS), has run a website called cityrinks.ca. 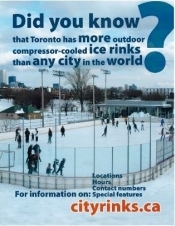 It deals with Toronto’s unusually large number of compressor-cooled outdoor ice rinks (53), most of them municipally owned. More recently, our website has also documented a variable number of natural ice rinks, both community-built and on frozen water. We don’t write about indoor arenas. By now, this website is a richly-detailed archive of ice-making and skating and winter sociability in Toronto. We offer this report to share what we feel are the current challenges to the outdoor rinks, and what solutions are available. We'll start with the summary list, and then back it up with the detailed stories, plus links for sources. 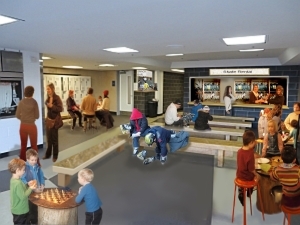 Fixes: make rinks more comfortable, have family-friendly social spaces, add snack bars, skate lending, better publicity, outreach e.g. to schools, places of worship, agencies with newcomer groups etc. Fixes: increase drop-in hours for rinks that are low, set up skate lending, put in direct phone lines for better communication. In 1993, Dufferin Grove Park got its compressor-cooled outdoor ice rink completely rebuilt. Over the next 15 years, park friends worked with city staff to gradually turn the existing rink culture around. The rink changed from being a fractious and sometime quite scary youth hangout to being an everyone-welcome winter clubhouse for the neighbourhood. By the end of the 1990’s, Dufferin Rink was getting very crowded, with people coming to skate from all over the city. Skaters and staff asked themselves why, with 48 other municipal outdoor rinks (at that time), people travelled across the city to Dufferin Grove instead of using their local rinks. This puzzle prompted frontline Dufferin Rink staff and some park friends to start making rink visits all over the city and to document how they were working. We wanted this information to be available to everyone, and so in 2003 we started posting it all on our new website. At first, part-time Dufferin Rink staff and rink friends did this for free; then as the far-flung rink visits took more time, we got some funding – including for the rink season of 2007-08 when CELOS contracted knowledgeable part-time city rink staff to prepare report cards for all rinks. Then as cityrinks.ca became more widely known and used, skater reports were added to the mix. By now, the balance has shifted to where almost half the reports we post are from rink users, although if there’s a problem, a rink visitor often does a follow-up visit. We deputed to the Parks committee about our findings in 2007 and 2008, but were told we should have gone to the Community Development and Recreation Committee. This 2016 rink report is going to the Community Development and Recreation Committee: Councillors Ana Bailão, Jon Burnside, Josh Colle, Paula Fletcher, Joe Mihevc, and James Pasternak (chair). Why go to the city councillors? Direction from the Community Development and Recreation Committee could be a help here, to guide city staff back into building community-and-city-staff partnerships. 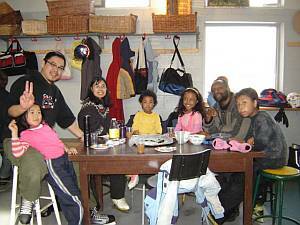 The aim: to allow the outdoor rinks to become centres of neighbourhood sociability, citywide. Since we started documenting the rinks, we have seen a steady improvement in the quality of ice maintenance – once the ice is in. Sadly, the rink start-up process has deteriorated at almost all rinks at the same time (see below). But the days when some rinks would get no ice-resurfacing for two or sometimes three days are gone. Holiday access is better – for example, from locking rinks on New Year’s Day, the city went to keeping all the rinks unlocked, and recently to unlocking more of the doors to washrooms and change rooms on holidays (such as Family Day) as well. More rinks that used to have windowless staff offices have had a window added, so rink users can find the staff. North York rinks no longer bar skaters during non-permitted times as they did formerly. More women’s shinny times and parent-child shinny times have opened up. Schools are no longer being asked to pay for bringing their students to skate during school hours. When no staff is available to guard the washrooms/change rooms during weekday-daytime, these facilities are left open in many Etobicoke rinks, in some North Toronto rinks and now in two central region rinks: Cedarvale and Monarch. This allows school classes and young families to warm up and be comfortable when they want to come and skate. 1. Access: Unlike central Toronto rinks, outdoor rinks in North York and Etobicoke rent out most of their prime time hours for permits. That means much less access for those neighbourhoods. The example of drop-in shinny hockey: Shinny hockey, or “non-contact” hockey, usually without body armour, and with no checking and no raising of the puck, needs the least equipment and is probably the safest form of hockey. NHL players often speak of it with longing, as the most fun they can remember. Pick-up shinny hockey brings neighbours of different ages and backgrounds together in pleasurable activity. The players may start out as strangers to one another, but they often don’t stay that way. Yet North York and Etobicoke rinks limit free, prime-time (after 5 on weekdays and all day on weekends) public access for shinny hockey to between 5 and 13 hours a week, compared to 30 or more hours a week in the central neighbourhoods. January 22, 2013, 3:45 - city website says this rink is "operational"
Rinks no longer have signs giving the opening date, or the reasons for being closed. All questions are directed to 311. Before 311, rink users could look in the phone book and call their local rink to ask about ice conditions. Then they could decide if they ought to get their skates and come down, or not bother until the ice was better. But in 2006 the order came to make individual rink telephone numbers unavailable to the public. Skaters were instructed to call one convenient number for rink information: 311. But the 311 outdoor rink information is wrong more than 50% of the time calculated over a whole season. No wonder. Every time the weather changes (sometimes three times a day), ice conditions may change. That’s way too many updates to be entered into a central reporting system, even with the area supervisors’ recently-added “real time” app. A phone call is a simple, straightforward solution for a problem made complicated (and expensive) through 311. Sooner or later, rinks will need to return to using the phone again. How about now? 3. The role of the union representing rink program workers: In 2012, many city part-time jobs were re-coded and re-described, as ordered by an earlier union agreement. Some codes were assigned more money; most got less. Since the Ward 18 rinks staff had developed a different, more collegial and creative way of working, they were asked to submit job descriptions that matched their non-typical rink work, and hand them in to management. The staff later learned that their descriptions were never submitted to the re-coding panel. Management dismantled the collegial work environment and replaced it with the hierarchical structure that was in place everywhere else. They said they were only following the collective agreement. And the union didn’t respond to this treatment of their workers. The issue of how part-time work could be more interesting and more effective – which Ward 18 rink workers had hoped would spread to other rinks in the city – didn’t register for CUPE Local 79. 4. ‘Rink literacy’: Over the past 10 years, staff knowledge of making ice at the start of the season has faded. 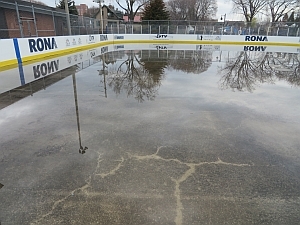 At many rinks, the traditional five nights of patient, thin-layered overnight floods, which can build good ice even at mild temperatures, have been replaced by three or even only two days of pouring water on rink slabs in the daytime or evenings. When the water doesn’t freeze, rink staff explain to frustrated skaters that “Mother Nature,” or an assumed difference in compressor power, is at fault. One year, rink friends got hold of hoses for two nights and showed that good ice could be made well above freezing. Since then, rink hoses have been locked up tight, and opening day continues to be a cliffhanger. From the TORONTO STAR, JANUARY 3 1958: "It is true that the parks department operates 58 natural ice rinks for skating and 23 for hockey - or will do so, if and when there is enough frost. For all the freezing weather we get here most winters, the department might as well spare the trouble and expense, and get on with the job of multiplying the number of artificial ice rinks." In the 1950’s and 60’s and 70’s, the Parks department did multiply the compressor-cooled ice rinks, as requested. 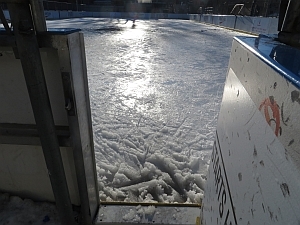 Until a few years before amalgamation, these rinks had a season that corresponded to the angle (and therefore power) of the sun – opening in low-sun mid-November and closing on the first Sunday in March – 15 weeks. But since then, the rink season has been on a roller coaster. 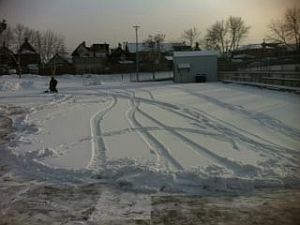 From 1996, the outdoor rink season was gradually shortened to 13 weeks, then 12, then 10, not opening until mid-December – with the exception of City Hall, Rennie Rink, and Dufferin Rink, which were opened a few weeks earlier. In 2003, Parks management proposed shrinking the rink season to only 8 weeks (didn’t happen). In 2006, a proposal was submitted to city council to close all city rinks permanently (except Nathan Philips and Mel Lastman Square). This didn’t happen either. 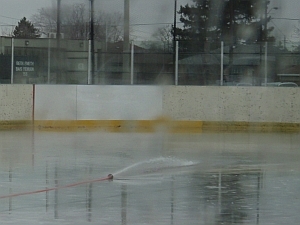 In 2007, Mayor David Miller said money was so tight that the rinks would not open for the season until January 1, 2008. That’s when Mastercard announced that it was donating $160,000 to open the rinks in December. 6. Understanding cost The question “how much does it cost to run the outdoor rinks?” seems to be impossible to answer. Over the last 10 years, the official dollar estimate has ranged from a low of $480,000 per season ($833 a week per rink) to a high of $12.9 million per season ($21,525,87 a week per rink). The high estimate is based on a 2007 city report called “Full Costing and Pricing Study”, which many supervisory city staff as well Parks and Recreation management worked on. In between those figures there are five other estimates, perhaps depending more recently on how much Mastercard or Tim Horton’s or Canadian Tire are willing to donate. See cost footnotes. One thing for sure, though, is that the city’s compressor-cooled outdoor rinks cost a lot. Maybe the Globe’s 2014 figure of $6 million a season ($10,000 per rink per week) is not far off, for direct costs. Could the city learn from how a non-municipal rink like Harbourfront’s Natrel Rink manages the cost, having no tax allocation to fall back on? Ward 18 rink friends and staff found out years ago that Harbourfront’s outdoor rink stays free of charge without cutting its season because it’s supported by money from skate rentals and food. So rink friends (through CELOS) and rink staff worked together to try adding food and skate loans to Dufferin Rink. Small city food access grants paid for two little kitchens for the rink clubhouse, and in 2005 the NHL Players’ Association donated 50 pairs of skates, plus sticks, gloves and helmets to start off the loan collection. The rink season income gradually rose to over $50,000 a year. Ward 18 councillor Ana Bailão got little kitchens put into Wallace and Campbell Rinks as well, and those also began to bring in some money. In 2012, CELOS transferred the running of the programs to city management. Management directed that the experienced staff who had built the programs would no longer be in charge – they were demoted back into the standard hierarchy of central supervision. When the staff protested, they were warned of being in “conflict of interest.” Some staff left, and others began to lose interest in the rink project. Food income began to go down, and staffing costs – because of the involvement of more levels of supervision, ordering and data entry, as well as high staff turnover – ballooned. Skate lending income at Dufferin Rink was still more than $5000 each month this past rink season. But the skate supply is shrinking and a great deal went missing – 40 helmets this season, as well as 20 sticks, 25 pairs of hockey gloves, and an unknown number of skates. The writing is on the wall: if food and skates are to be used to help with costs and to enliven underused city rinks at the same time, a different way of working has to be found. 7. The way rink jobs are structured, and why that structure doesn’t work: Zamboni drivers earn between $27 and $31 an hour, with 33% benefits. The program staff (i.e. those whose main job is to work with people, not machines, and only hired as part-time) earn between $11.25 and $16.70 an hour, with 18% benefits. Each staff person has a narrow job description – Zamboni driver, or building attendant, or rink guard, or maybe a skating teacher. At Ward 18 rinks they may also serve at the snack bar or do skate lending, or sharpen skates, or teach shinny hockey to beginners. Those untypical jobs are sometimes coded as “arts and crafts,” because no suitable job description was ever settled on. The staff at non-municipal rinks, like Harbourfront and the Brickworks, don’t have that division of labour – they share almost all the work among them. A story from the Feb.11, 2016, Greenwood Rink diary: The staff tend to gather around the large front desk, (or, at other rinks, in their offices, windowless or not) to chat amongst themselves and with their friends. They are courteous to skaters who come and ask for information, but quickly revert to their own social scene. And indeed -- what else is there to do? The job of the zamboni operator, except during storms, is to resurface the ice twice or three times on an eight-hour shift. The recreation staff pass half the time playing cards or chatting, with the rink guards taking a few rounds on the skating trail, and then back in again to warm up. There is no snack bar or skate rental to keep the staff occupied. There's not even a publicly available phone number that would require staff to talk to people who want to find out how the ice is. The only urgent tasks are negative: to make sure nobody takes a picture, to see that all little skaters from toddler to age 6 are wearing CSA-label hockey helmets, and to keep skaters from being on the ice with the Zamboni. A big problem with rink staff is the question of whether they have agency. Creative action, being an agent of change rather than just following orders, is discouraged by management. The rink staff have ideas, but they don't have the feeling that they can try things. Someone says, "Can you imagine that they rebuilt this place without a sound system?" I say, "At another rink they hook an old city amp/speaker up to the staff's playlist, and it works fine." He says, "We would never be allowed do that here." Someone says, "There's a better route for the zamboni to take when it resurfaces the hockey ice, one that doesn't require the driver to cut across the skating trail. When the driver has to cut across the trail, skaters could be run over. But if the city were to join two parts of an existing concrete path with another ten feet of concrete, the problem would be solved. We all know it, but they'll never listen to our opinions." Giving up before they even begin. The task ahead: allowing the outdoor rinks to become centres of neighbourhood sociability, citywide. Despite the progress made in maintenance and access over the years, the city’s collection of outdoor rinks is still in many ways a $6 million orphan. Rinks need capable friends, and only the cross-fertilization of on-site staff, management, and rink users can build the necessary friendships. All organizations, not only the rinks, need lateral staffing structures that allow local staff to work together instead of being barriered inside silos – as is so often the situation with municipal workers. The network of outdoor rinks can be a laboratory of friendly, collaborative action or it can be a distressing poster child for the brokenness of city departments. We suggest the former.